Nicholas Bourriaud’s suggestive (though controversial!) notion of a “relational aesthetics” has drawn attention to the way the production and reception of art are always-already embedded in the “realm of human interactions and social context.” This is an aesthetics of sharing and “interhuman exchange,” where our encounter with the artwork is not a private, individual affair but involves “the collective elaboration of meaning.” In his book Postproduction, Bourriaud extends his account of the relational, contextual character of art to describe the nature of creativity in a digital culture characterized by the ceaseless “reprogramming,” remixing and transmission of pre-existent cultural forms – a global culture of sharing and the free flow of images. However, Bourriaud’s insights occasion an important question: how does a “relational” aesthetic, in an age of digital “postproduction,” alter our experience of narrative, including the political, social and religious narratives which shape and direct our lives? I suggest that a helpful term in thinking about the role of art is “re-narrativization” – telling a new story that simultaneously deconstructs and reconstructs earlier narratives, symbols and networks of meaning. Artists have always creatively engaged their historical, social and aesthetic contexts to transform pre-existing stories into new, often subversive patterns, from Milton’s “re-narrativization” of the Genesis story in Paradise Lost to the appropriative practices of Pop Art and Situationist détournement. To be an artist is to creatively engage what has come before – Bloom’s “anxiety of influence” – while working the material into new narrative possibilities. I contend that our understanding of art is deepened by a relational, contextual approach to “living into” the narrative worlds opened by such (re)creative works of art. Using as examples the work of video artist Douglas Gordon, filmmaker Arthur Lipsett and even the strange “communal” experience of the “Sing-a-long Sound of Music,” I hope to explore the transformative significance of artistic “re-narrativization” as offering the possibility of both personal and cultural renewal. Nicholas Bourriaud, Relational Aesthetics, trans. Simon Pleasance and Fronza Woods (Dijon: Les Presses Du Reel, 2002), 15; Postproduction: Culture as Screenplay: How Art Reprograms the World (New York: Lukas & Sternberg, 2002). 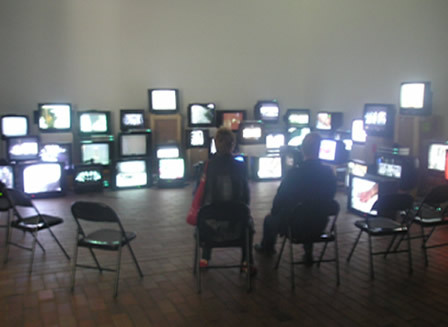 Cultural theorist Fredric Jameson first employed this term as a way of describing appropriative works of art which reconfigure pre-existing texts and images into new, hybrid “textualities,” such as certain forms of video art; it has also been widely used in feminist and postcolonial criticism. See Fredric Jameson, Postmodernism: or, the Cultural Logic of Late Capitalism (Durham, NC: Duke University Press, 1991), 96. Any particular narrative re an artwork is secondary to the actual experience of the artwork. Narratives are, at best, only common to particular groups. The (genetic) universality of any particular group’s narrative has been explored since the end of the 19th century.